Inspired by a retrospective exhibition of artist Vicktor Hartmann’s drawings and paintings, Mussorgsky created this musical tribute to capture the emotions his art evoked in him. 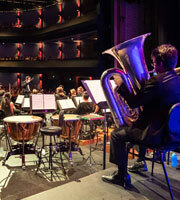 Combining the thrill of live orchestra with the movement of performance artist Andy Dexterity’s dance, physical theatre and signed languages such as Auslan, this dynamic concert will spark your students’ senses, allowing them to visualise each movement and be transported to Hartmann’s exhibition. This unique experience will give your students a new depth of music appreciation that will last a lifetime. FYI this concert is Auslan inclusive. Bookings through Sydney Symphony Orchestra only. To book email education@sydneysymphony.com or call 02 8215 4603. For more information and bookings for the Primary School concerts click here. For more information and bookings for the Secondary School concerts click here.